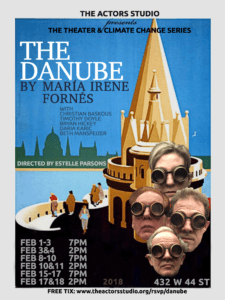 The THEATER AND CLIMATE CHANGE series continues with Maria Irene Fornes’ THE DANUBE. This is a play that starts in Budapest, Hungary in 1938 and “soon departs from chronological realism”. Like all of Irene’s work it is about the lurching of the human race from its past into its future. The cast is Beth Manspeizer* (who last year brought us the profoundly interesting MUD by Irene Fornes), Chris Baskous*, Timothy Doyle*, Bryan Hickey* and Daria Karic. The creative team consists of Estelle Parsons*, Peter Larkin and Myla Pitt* and The Climate Change experts, who speak after the performance include Mark Chambers, director of the Department of Sustainability in Mayor deBlasio’s Climate Change program, Michael Gerrard, head of the Sabin Institute at Columbia Law School, Justin Brice Guiriglia who photographed the melting of the Greenland glaciers, and Mary Evelyn Tucker and John Grim, senior lecturers and research scholars at Yale University in the School of Forestry and Environmental Studies as well as the Department of Religious Studies. The performances of THE DANUBE and the post show discussions with the Climate Change experts will take place on three weekends in February. Latecomers will be seated at House Manager’s descretion. Please be courteous, if you need to cancel, please do so on Eventbrite or call 212.757.0870, ext 0. * Denotes lifetime Actors Studio members.